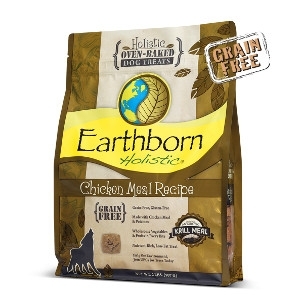 Earthborn Holistic® Oven-Baked Chicken Meal Recipe Biscuits 14 oz. Earthborn Holistic® Chicken Meal Recipe Biscuits have a taste your dog will love and health benefits any pet parent will appreciate. Your dog can enjoy these low-fat, grain and gluten-free treats while still maintaining a healthy, active lifestyle. Premium chicken meal protein and a mix of vegetables and fruits creates high palatability. Powered by the cutting-edge ingredient, Antarctic krill meal, these treats are a nutrient-rich source of Omega-3 fatty acids.